Originally published in 1987, this was the only available book to offer a critical interpretation of the current reform efforts in teacher education at the time. The focus is issues of professionalization, the role of the university and schools in the socialization of teachers, and the ideological and social assumptions that underlie educational theory. The book draws upon the sociology of knowledge, Marxist theory and political sociology. Preface. Introduction. 1. Ideology and Social Formation in Teacher Education Thomas S. Popkewitz Part 1: Teacher Education, Class Relations and Gender: Historical Perspectives 2. Workplace Autonomy and the Reforming of Teacher Education Paul H. Mattingly 3. Gendered Teaching, Gendered Labor Michael W. Apple Part 2: Professional Education: Forms of Labor and Ideology 4. Reproduction, Contradiction and Conceptions of Professionalism: The Case of Pre-service Teachers Mark Ginsburg 5. Professionalism, Proletarianization and Teacher Work Kathleen Densmore 6. Ideology and Control in Teacher Education: A Review of Recent Experience in England Geoff Whitty, Len Barton and Andrew Pollard Part 3: Myths and Rituals of Control 7. The Persistence of Myth in Teacher Education and Teaching Catherine Cornbleth 8. Tracing the Provenance of Teacher Education Barbara Schneider 9. Clinical Supervision and Power: Regimes of Instructional Management Henry St Maurice Part 4: Alternative Perspectives to Professional Education 10. Teacher Education as a Counter Public Sphere: Notes Towards a Redefinition Henry Giroux and Peter McLaren 11. Teacher Education in Cultural Context: Beyond Reproduction Landon E. Beyer and Ken Zeichner 12. 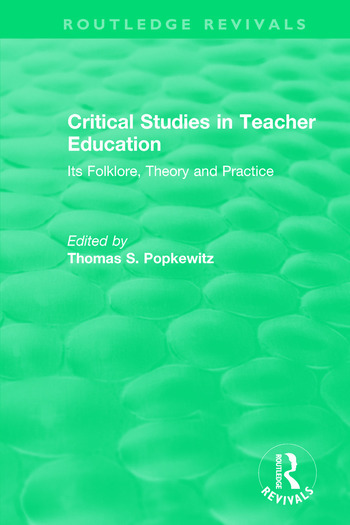 Knowledge and Interest in Curriculum Studies Thomas S. Popkewitz. Notes on Contributors. Index. Thomas S. Popkewitz (born August 16, 1940) is a curriculum theorist and professor from the United States of America, on the faculty at the University of Wisconsin–Madison School of Education. His studies are concerned with the knowledge or systems of reason that govern educational policy and research related to pedagogy and teacher education. His research includes histories of the present, ethnographic and comparative studies of national educational reforms in Asia, Europe, Latin America, Southern Africa, and the US.